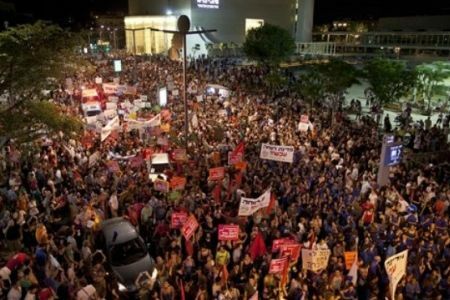 Thousands of Israelis are set to stage a demonstration in Israel to protest at the high cost of living and social inequality in the occupied lands. Fresh rallies are planned for Saturday in several Israeli cities including Tel Aviv against the economic policies of Prime Minister Benjamin Netanyahu. There have already been weeks of anti-regime demonstrations in Israel with many people arrested during the protests. The demonstrators say they can no longer afford the sky-rocketing housing prices, which have jumped by 50 percent in recent years. They are also calling on the regime to curb the high costs of fuel, food and healthcare. The protests have exposed a deep middle-class frustration over the economy, presenting Netanyahu with his biggest domestic challenge yet.